We filmed eccentric Bavarian Magic Alexander de Cordova perform, when he made his only lecture here in America. Later we got him aside and he revealed in detail the methods, history, and thinking behind the dozen knockout effects on the two ENIGMATIC volumes. 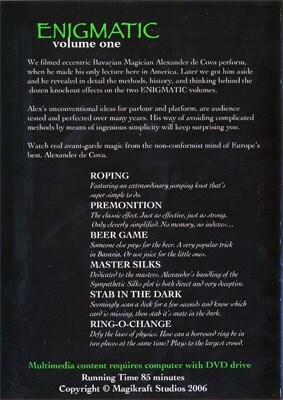 Alex's unconventional ideas for parlour and platform, are audience tested and perfected over many years. His way of avoiding complicated methods by means of ingenious simplicity will keep surprising you. 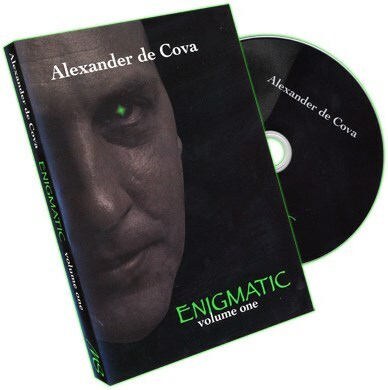 Watch real avant-garde magic from the non-conformist mind of Europe's best, Alexander de Cova. Featuring an extraordinary jumping knot that's super simple to do. Someone else pays for the beer. A very popular trick in Bavaria. Or use juice for the little ones. Dedicated to the masters. Alexander's handling of the Sympathetic Silks plot is both direct and very deceptive. Seemingly scan a deck for a few seconds and know which cards is missing, then stab it's mate in the dark. Defy the laws of physics. How can a borrowed ring be in two places at the same time? Plays to the largest crowd.